It may be cold in Melbourne now but with summer less than 6 months away many Australian couples are planning their summer wedding. Taking advantage of the beautiful weather ahead to host a luscious outdoor extravaganza. 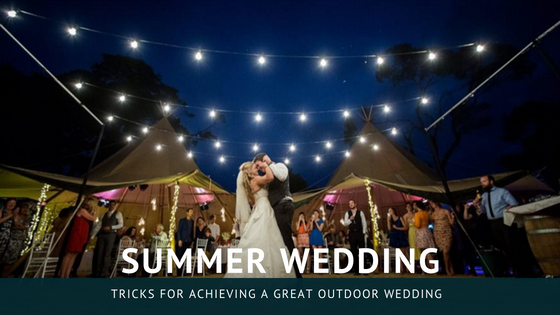 When it comes to summer, Australia is the lucky country, however, it’s important to remember that planning for an outdoor wedding brings with it a few unique hurdles and potential pitfalls that you need to be aware of. That’s why we’ve put together this quick list of three basic tricks and tips you can make use of in order to ensure your outdoor wedding is as glamorous and memorable as it deserves to be. Wind, background noise and other everyday eventualities can often make it difficult for your guests to hear at an outdoor wedding, which is why it’s important to ensure you have good audio systems set up. By making sure that there is a microphone available for the relevant parties to use, should it become necessary, you can feel confident that everyone will be able to hear and enjoy the ceremony regardless of whether they are in the front row or way in the back. A great way to add a touch of class and style to your outdoor wedding is by investing in a bridal canopy, which serves as a marvellous frame to the actual ceremony itself. You can add additional extras to your canopy such as organza bows and ivy – for even more style – and there are plenty of unique designs and colours available which will ensure your canopy meets the aesthetic design of your wedding. There are a lot of things that you can control in the build-up to your wedding, such as what audio visual equipment you have and what everyone will be wearing, but there simply is no way to control the weather. Rain doesn’t have to ruin your big day however so long as you have a backup plan in place. Make sure there is an indoor location nearby and available that you can make use of should the worst happen. If you are planning your summer outdoor wedding, get in touch with Pro Light & Sound today. The weddings we work on are incredible and our experience and expertise mean that we will think of EVERYTHING so you can focus on what’s important… the “I Do’s”!